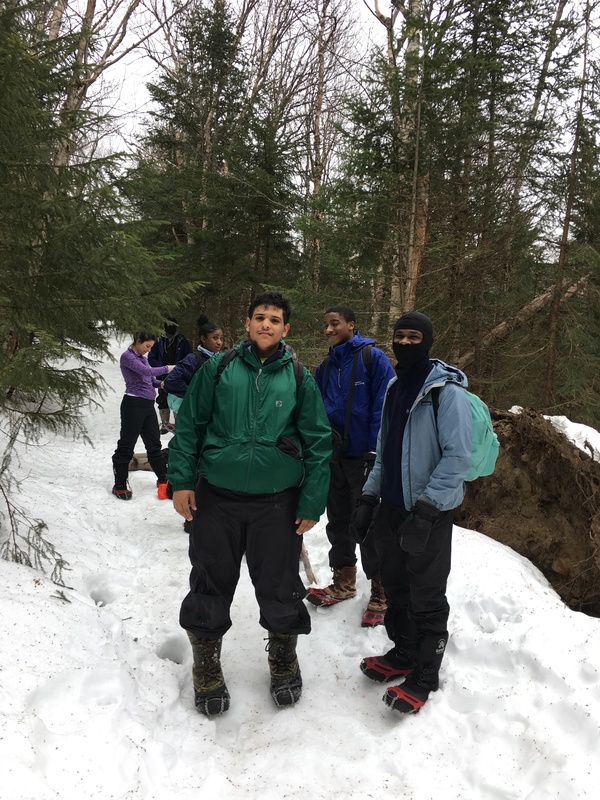 This week we went on a hiking trip in New Hampshire with the NYC School Year Ambassadors. The purpose of the trip was to connect each cities ambassadors, and learn what each of us has done through the program. Thursday we arrived at the office while the New York ambassadors slept overnight here, we then got packed up and loaded up the vans with all of the equipment for the hiking trip. We then formally introduced each other and played an icebreaker I chose which was detective. After that we all got ready for the 3 hour drive to New Hampshire, Most of us slept during the ride since we got up so early. Once we got there we dressed up warm in all of our gear and prepared to hike Mount Willard, before that we played another icebreaker where we lined up birthdays from the beginning of the year to the end. Then we were off to hike as a group, we switched roles from lead and caboose making sure everyone took breaks and was drinking lots of water. 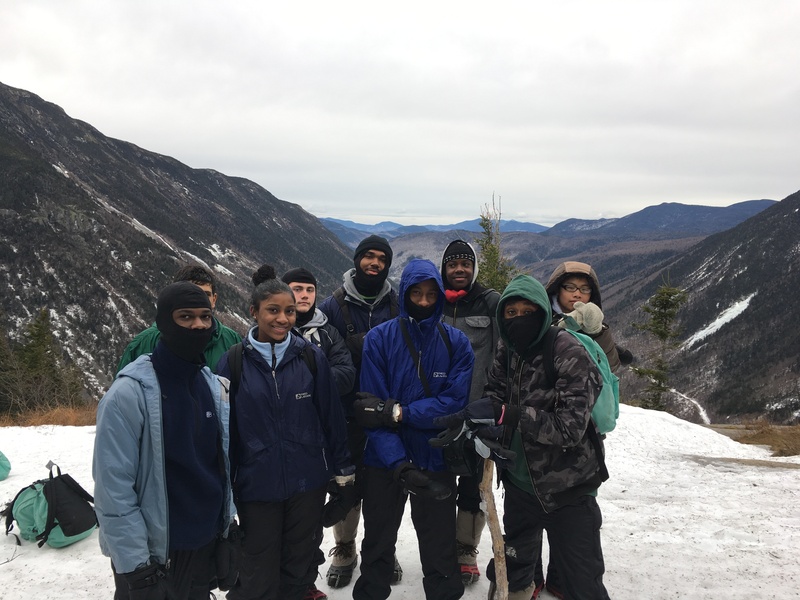 Also we conversated throughout the hike up Mount Willard and asked questions to one another about the program and different things we did. We finally reached the top of the mountain and took a lot of pictures, together. After we played a few icebreaker games that helped us know more about one another. 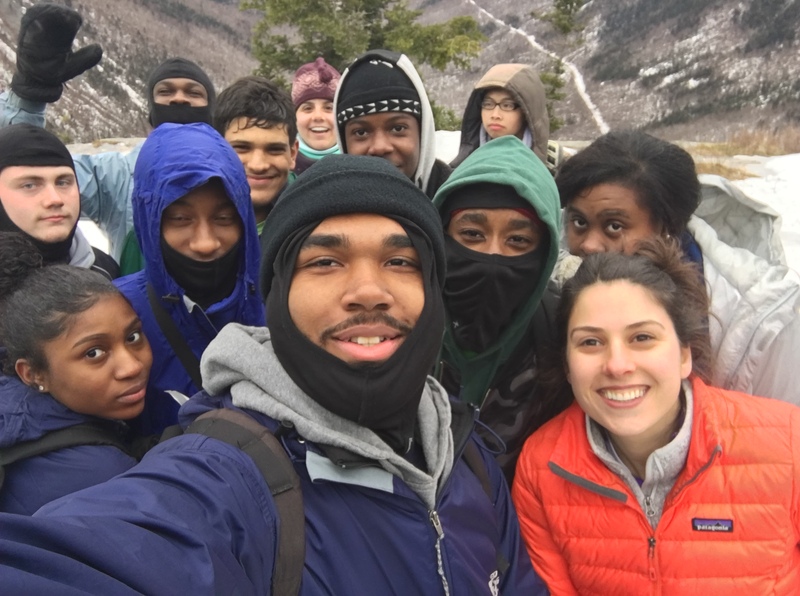 The school year ambassadors were ready to head down the mountain, while going down we slid down ice hills and were moving down quickly to relax. After we had some down time to shower, sit, relax and talk to each other before dinner. At 6 it was dinner time so we went to the AMC center and digged in on the amazing food that they made for everyone. We talked and had some laughs during diner time. We headed back to the lodge to play games, everyone wanted to play manhunt outside where 1 person is it and has to hunt the other people. We played for a little and it was fun hiding and running in the dark, we headed back to play some group games together. We started the night off with spoons where there is a circle of spoons and a deck of cards one person is in charge of picking up a card and passing one of while having 4 in their hand. The goal of this game is to get 4 of the same card and once someone does everyone grabs a spoon whoever doesnt is out. The next game we played was charades with 2 teams of 4 it was really funny and competitive. Lastly we wanted to play hide and go seek in the dark in our cabin since it was big enough. We played a lot of rounds it was hard playing because of the main areas being small. We then had some more down time since some people wanted to go to bed early, other stayed up to talk about different things from each of our groups. The next morning we woke up early to get packed up, load up the vans and get ready to eat breakfast then head out. This was a good opportunity to meet the NYC Ambassadors and get to know one another and learn about each others programs.